We are living in times, where under the ruse of change, perpetual upheavals are rocking the inner functioning of the Corporate World. In a bid to keep up with the expectations of shareholders and earnings forecasts of analysts tracking every metric of the company, corporations are constantly looking to ‘reinvent’, ‘re-purpose’ and ‘re-engineer’ themselves. This insane endeavor in turn has spawned a new cottage industry where Management Gurus, Change Consultants and self-proclaimed Life Coaches run riot, upending the very notion of work as it is conventionally known. The proselytization of these prophets (for this is exactly how the consultants with their seemingly imponderable views are looked at by companies), however unconventional, absurd and impractical brooks no resistance and new ways of doing work are foisted on unsuspecting employees. The tech industry is most notorious for both advocating and purveying constant change. Spurred on by Venture Capitalists seeking to make a quick buck out of new albeit temporary trends, the obsolescence in the industry is not merely restricted to products and processes. 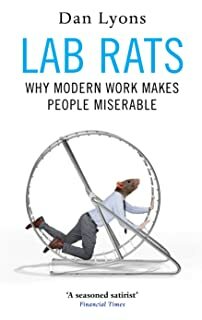 In his at times hilarious and at others harrowing book, “Lab Rats: Why Modern Work Makes People Miserable”, Dan Lyons lays bare a mercenary culture that has enveloped the tech industry. As Lyons illustrates this is a culture that wrings every ounce out of the employee, squeezing him dry before moving on to the next in line. Lyons knows what he is writing for he himself has been an unwitting victim of this macabre dance. In Lab Rats he takes over from where he stopped in Disrupted. The curse of management gurus has only proliferated in recent times as beliefs such as Agile and Lean Start Up take on proportions that are contagious. A former Agile consultant Daniel Markham, says, “This is destroying people’s lives. It’s gotten worse. I drive the ambulance, so I see all the bodies on the road.” The latter statement a reference to Markham’s latest job of bringing Agile-infested companies back on the rails. The coterie of high end management consultants does not just end with Agile and Lean Start Up. Unbelievably far-fetched and ludicrously insensitive fads such as Holacracy – A self-management practice the brainchild of Brian Robertson, have had companies in a vice like grip. This grip is squeezing the life out of employees – literally. During the years 2014 through 2017 a spate of suicides rocked the payrolls of France Telecom. Most of the unfortunate employees were those above fifty and who were technical engineers forced out of their competencies and made to slog as call centre employees. Subject to constant surveillance and performance monitoring, taking their own lives was the only way in which these people could redeem their dignity. Lyons also highlights the plight of warehouse workers in Amazon. The workers are so poorly paid that many of them look to food stamps for subsistence. Their performance is monitored in such an inhuman and ruthless manner that there have been instances where employees have resorted to urinating in bottles in order to avoid wasting time on bathroom breaks! This in a company whose owner has clocked up a net worth of $140 billion (before adjusting for inflation). Operating in lockstep with these companies are a multitude of venture capitalists. Exhorting tech startups to operate a business model that takes for granted a high staff turnover, the combination creates a scenario where, “Employees can (and should) be underpaid, overworked, exhausted and then discarded.” To aid and assist companies in this endeavor are a few military and sporting metaphors. Sample this: LinkedIn founder Reid Hoffman is of the firm conviction that we should think of the employer-employee relationship in terms of a “tour of duty”, while Netflix’s notoriously fierce human resources “culture code” declares that the organisation is “a team, not a family” – the idea being that your place in a team is contingent on your performance, whereas the unconditional love of a family is bound to engender complacency. Lyons rightly pooh poohs this analogy as baseless since, “the best pro sports teams succeed exactly because the players feel like a family”. Dan Lyons identifies ‘four tech-related tendencies’, what he calls “The Four Factors” – that contribute to worker unhappiness: Money; Insecurity; Change and Dehumanisation.”. However, with the Quiet Movement making a resurgent appearance with a focus on Customers, Employees and Communities, there is still hope that all is not lost, yet. At least let us hope so for the sake of the world in general.